This week, reigning MVP Stephen Curry broke Kyle Korver’s record of 127 consecutive games with a three-pointer made; Kristap Porzingis has further enticed fans in New York so much that one bold female fan even invited the Porzingod to her prom; and veteran “Iso” Joe Johnson is set to sign with the Miami Heat after clearing waivers. 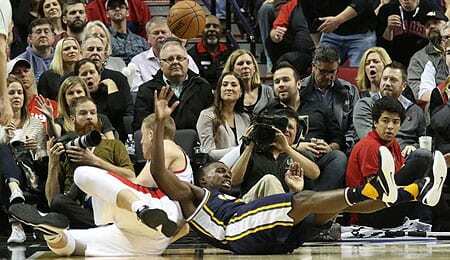 Shelvin Mack, PG, Utah Jazz (ESPN: 13.3 per cent; CBS: 40 per cent): Utah’s newly acquired point guard made an immediate impact, scoring over 15 points in each of his first two games. Coming from the Atlanta Hawks, Mack has gone from having virtually no role (he hasn’t shown value since last season; see video below) to being a starter in Utah. Even with teammates Trey Burke and Raul Neto competing for PT, Mack seems to have the inside track, and should be the favourite Utah point guard to target in Fantasy formats. Cory Joseph, PG, Toronto Raptors (ESPN: 9.8 per cent; CBS: 17 per cent): CoJo has been playing effectively off the bench, scoring double digits in four straight games before Friday and dishing out some dimes as the Raptors’ backup point guard. Though All-Star teammate Kyle Lowry has been playing stellar, Joseph is the perfect reserve to help his team, and perhaps yours in deep leagues as a points and assists contributor. Doug McDermott, SF, Chicago Bulls (ESPN: 17.6 per cent; CBS: 25 per cent): McBuckets returns to the Wire Troll, still doing his best to shoot the lights out game in and game out. His opportunity to do so extends while teammate Jimmy Butler remains sidelined, so he’ll see heavy minutes until Butler’s return. Though McDermott doesn’t offer much value other than his three-point shooting and points, it might just be enough to give your team a lift in those categories. Bojan Bogdanovic, SF/SG, Brooklyn Nets (ESPN: 11.5 per cent; CBS: 23 per cent): Bogdanovic poured in a season-high 24 points to go along with two boards in 38 minutes on Thursday as the Nets claimed a win over the Suns. The second-year pro is expected to contribute beyond just scoring categories, and will have a better opportunity to do so with Johnson being released. Bogdanovic’s new starting role could turn out to be quite rewarding, so make a claim on him pronto. Ed Davis, Portland Trail Blazers (ESPN: 22.2 per cent; CBS: 44 per cent): Davis may be another one of those guys with limited Fantasy upside, but his occasional outbreaks still makes him somewhat appealing. His biggest stat appeal is definitely his board grabbing ability. One-dimensional or not, a player like Davis helping out in one category is better than none, and could be the difference in a sneaky victory. David Lee, C/PF, Dallas Mavericks (ESPN: 11.6 per cent; CBS: 28 per cent): Lee has really been an afterthought since we pegged him as a candidate as Fantasy Dud of the Year in 2014. However, now that the veteran big man has been set free by Boston and landed in Big D, he’s reminding us why he used to be so coveted by Fantasy owners. While Lee only played 15 minutes in his Maverick debut, he saw 25 minutes of action off the bench on Friday, responding with a double-double, two dimes and a steal. He led Dallas in rebounds with 14, and while much of that can be attributed to the Mavs going small, it still proves he’s capable of contributing when he gets the PT. Lee makes for an interesting speculative pick for those seeking boards. While others tried to showcase skills and become a recognizable face to those that cover the league for the media, Exum’s agent chose to keep his client a mystery, eliminating the opportunity for scouts to see how he compared to the rest of the rookie class. The mystique strategy appeared to be nothing more than an attempt to get drafted very high based on stats earned in an environment considered inferior to the D-League.